Kids may know the latest apps in the app store but have no idea what even the names of the vegetables are. We needed to help kids and vegetables to become friends. 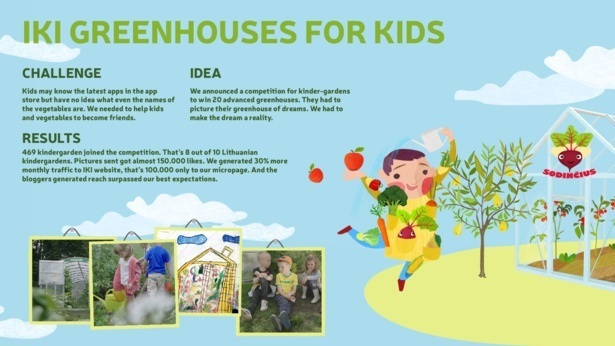 We announced a competition for kinder-gardens to win 20 advanced greenhouses. They had to picture their greenhouse of dreams. We had to make the dream a reality. 469 kindergarden joined the competition. That’s 8 out of 10 Lithuanian kindergardens. Pictures sent got almost 150 000 likes. We generated 30% more monthly traffic to IKI website, that’s 100 000 only to our micropage. And the bloggers generated reach surpassed our best expectations.